The grey carbon fiber set into this piece is the focal point, set into a stainless steel cross to look like a mesh pattern and add a bit of texture to what would otherwise be a smooth piece, as well as a tiny bit of contrast between the pure silver of the stainless steel and the grey of the carbon fiber. The cross hangs on a twenty inch chain, and the entire piece is polished to shine. It's certainly appealing to look at, and will stand out for its unique texture and presentation, while still being simple enough to fit with pretty much any outfit that the owner might want to wear with it. 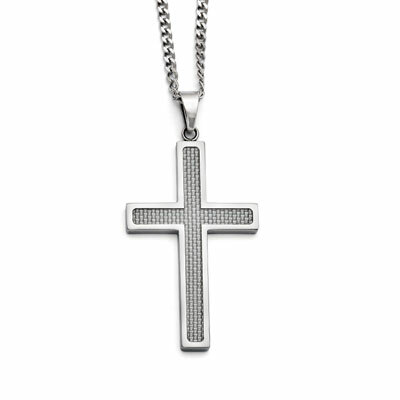 Carbon fiber, one of the strongest man made materials is the centerpiece for this large stainless steel cross necklace. Pendant measures 50mm (1 15/16") x 32mm (1 1/4") not including bail. Pendant comes with a 20 inch 2mm curb chain. We guarantee our Grey Carbon Fiber Stainless Steel Cross Necklace to be high quality, authentic jewelry, as described above.